ATTENTION COIL BUILDERS: Koiler is offering a free package of their pre-built Fused Clapton Coils! Each pack includes two fused clapton coils with organic Japanese cotton. You just pay $1.99 for shipping – there are no other catches or gimmicks. Koiler is a wholesale supplier of high quality Kanthal, Nichrome and Ni200 wire, and they also offer pre-built fused Claptons in dual 24G x 36G (2.5 or 3mm) and dual 26G x 36G (2.5 or 3mm). 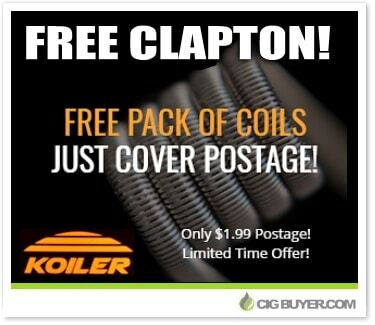 Free Koiler Fused Clapton Coils - CLAIM YOURS NOW! * Expiration of this offer is unknown. Good while supplies last.